Fast turnaround times, no storage or manufacturing costs. We know booking the same floor space for the following show can be a challenge which becomes even more difficult when storage and refresh costs are added to the equation. Our creations can be turned around within a matter of weeks providing an entire blank canvass to best communicate your brand. In an ever changing industry it has never been more challenging to reduce carbon footprint and save costs while better promoting your brand. Developed with you the client in mind and through years of experience we deliver a complete solution that provides all the benefits of modular with the impact of bespoke. Our system is made up of three parts which create the ultimate all inclusive package with the CORE structure, the PEEL outer graphics and the FRESH built in technology. Now a single system gives you the option to present something unique and surprising at each event. Handling every aspect of the process from design, audio visual/furniture hire to completion from only £182 per sq metre for our MEvo package. 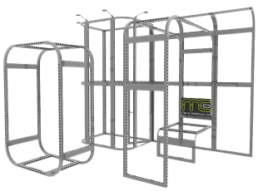 Created using aluminium frames MEcore is the nuts and bolts to our solution, which provides an eco friendly, lightweight and durable core to all our stand designs. Through this core we eliminate manufacturing costs passing savings to our customers. 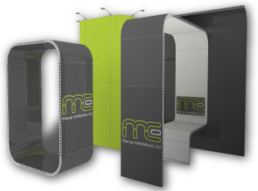 With MEcore we can create virtually any size or shape imaginable where walls and ceilings blend seamlessly, forming a single flowing structure that sets your stand apart from the competition. 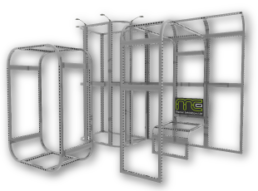 It’s not our MEcore structure, but your visual communication that receives all the attention thanks to MEpeel. As we fix our panels, textiles or alternative in-fills onto MEcore, our structure is hardly visible, leaving more space for art work producing a clean and uniformed look. These display elements can be created using varying materials that will attract the attention of passers-by and communicate quickly and effectively with them. 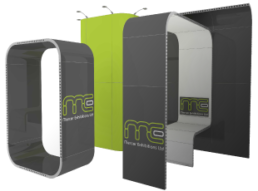 Through incorporating the latest technology within our stand designs we aim to provide an engaging interactive experience that gives you the perfect platform to showcase your brand. 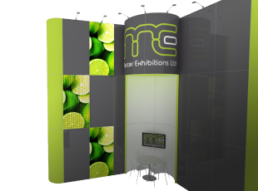 From viewing your stand before the show with virtual reality to video walls and interactive displays our team are at the forefront of everything tech. % Saving in comparison to bespoke.